Though we still don’t know if CSI: NY will be cancelled for renewed for a 10th season, we do know there will be at least one CSI show on the air next season. CBS has renewed the original, CSI: Crime Scene Investigation, for a 14th season. Ted Danson has extended his contract to stay on the series and Elisabeth Shue, George Eads, Jorja Fox, Eric Szmanda, Paul Guilfoyle, Robert David Hall, Wallace Langham, Elisabeth Harnois, David Berman and Jon Wellner will return as well. Currently in its 13th season on CBS, CSI: CRIME SCENE INVESTIGATION wins its Wednesday (10:00-11:00 PM, ET/PT) time period in viewers (11.85m), adults 18-49 (2.9/08) and adults 25-54 (3.8/09). It is also a global ratings hit, earning the International TV Audience Award for the “most watched show in the world” for the third consecutive year, and fifth time in seven years. What do you think? 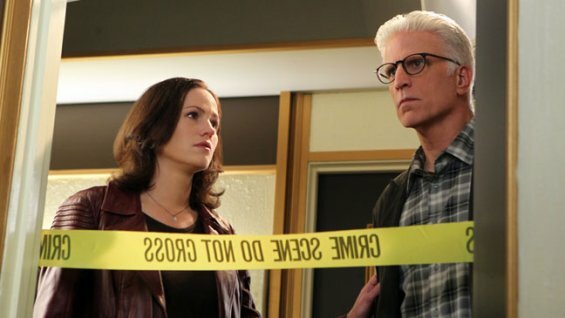 Are you glad to hear that CSI is returning? Do you think Danson was a good addition to the cast? So glad to hear that CSI LAS VEGAS was not cancelled. Love Ted Dansen on CSI and hope it keeps going. And Ted has such a young looking face and a spectacular head of great hair, if he’d only not let it go so totally gray, since gray hair adds 20 years to a man. But he has the greatest hair I’ve seen on a man yet. His part in CSI is a good one and II hope it keeps going..It’s a good fit. Absolutely stunned to hear that the show is returning for a 14th season. Way to go, CBS! Love love this show. i am glad they are all coming back. Love this show. i am so glad its coming back. wish csi Miami would come back. I love love all the characters. i am glad they are all coming back. Love Elisabeth Shue and Danson in CSI!!! !